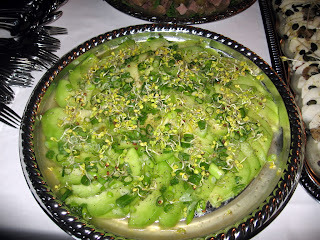 As part of our friend's birthday party, we went to Spindler and Klatt, one of those supper clubs where you eat on beds. This turns out to be much better in theory than in practice. It's hard to sit comfortably in a a skirt in a bed. It's hard to cut meat with a knife on a bed. It's hard to eat soup on a bed, and where are you supposed to put your drink. Furthermore, the service was some of the worst we've ever had. It took the waiter at least 45 minutes to even take our order. The food arrived slowly and much of it was missing. We aren't sure how much the meal cost because we didn't pay. Overall, this was not a pleasant experience. 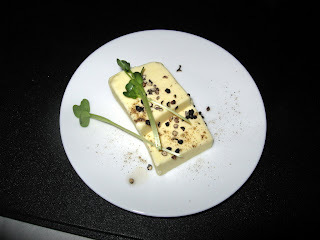 With microgreens and pepper, this was one of the prettier butters we've seen. 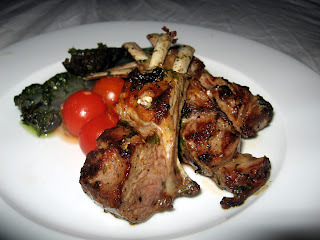 Not much going on flavor-wise with this dish, and the lamb was minimal. 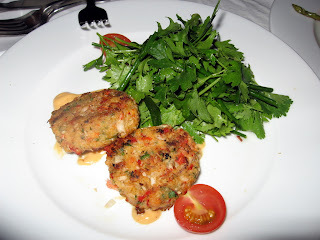 The crab cakes had way too much filler and the parsley salad was overpowering. Tasty, if a bit over cooked. 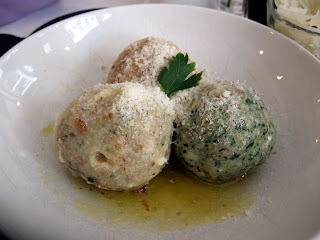 We had heard about Leo Bettini, a place that only serves (and sells to cook at home) only homemade pastas and dumplings. The shop itself was delightfully decorated. It was whitewashed in a country style, but very modern in design. The minimalist furniture and walls, devoid of color, were a true showcase for the handmade products. For 2 meals of 3 dumplings each, served with a simple cabbage slaw, and 2 glasses of wine, the bill was less than 20 euros. These dumplings were dressed simply in olive oil and a bit of parmasean. 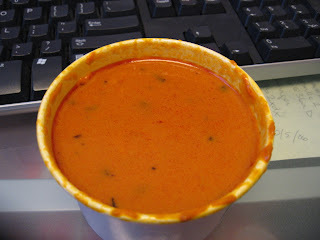 The three flavors were distinctive and delicious, with the tomato-cheese as our favorite. A hint of vinegar made this a great accompaiment to the rather heavy dumplings. A friend of a friend in Berlin had a chef cater a dinner at his house. 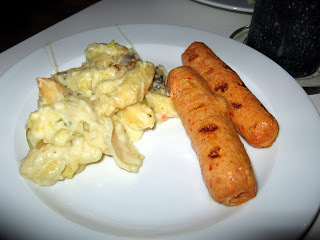 The food can be described as modern German and it was quite a nice treat to be cooked for. This was an interesting take on the quintessential Berlin streetfood, the currywurst. The curry sauce was a nice combo of sweet, salty and spicy, and the prawn sausages were tasty. The gnocchi were the true standouts, though. To be eaten with the currywurst above. A fresh accompaniment. 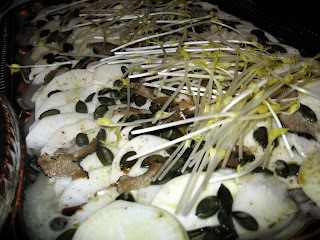 We thought that the mix of the lowly turnip with the high-brow truffle was interesting. Also, we'd never had turnips prepared raw, despite the fact that we eat turnips regularly. 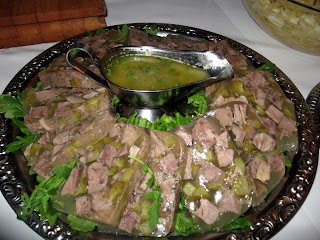 The sauce was great, and the jellied terrine was better than expected. However, it was still meat in jelly, which is less than appealing. 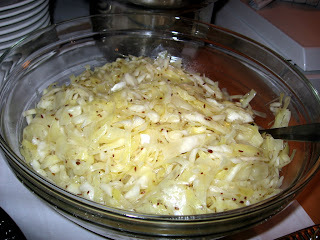 Seasoned with vinegar and caraway, this simply cabbage dish was much better than the mayonnaisy American version. Yum. 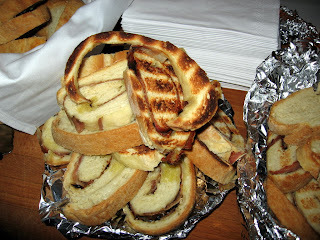 Grilled bread with prosciutto baked in and doused with olive oil. The texture of the sherbet was a bit icy and granular, but fresh mango is always tasty. For our first meal in Berlin, we decided to go to WDK Lebensmittel, a restaurant that was within walking distance from our hotel and that was on Food and Wine Magazine's "Go List". This laid back cafe was half restaurant, half storefront. You ordered at the counter and were brought your food. Our whole meal came to only 20 euros. The only issue we had is that the menu that was written on the chalkboard was in German (obviously), and in a script that was difficult for us to read...so much so that we could barely translate. It turned out to be a good, hearty, Bavarian meal. 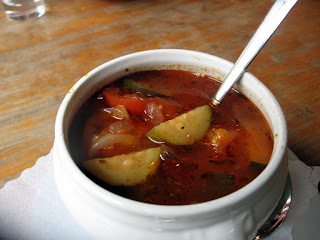 Simple and flavorful, with large chunks of veggies and a thin broth. 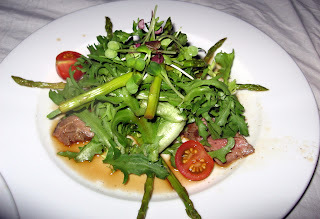 Served with the spaetzel below, this salad was simply and tasty. These homemade noodles were held together with thick, sharp cheese. 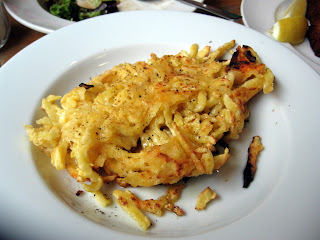 Although it was a bit burned, this German version of mac 'n cheese was very much what I'd imagine as German comfort food. 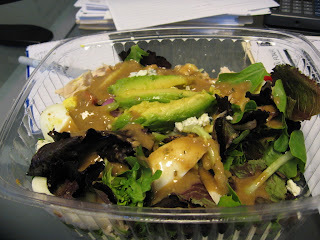 This lukewarm soupy salad was ever-so-slightly acidic and surprisingly delicious. It was served with the shnitzel below. 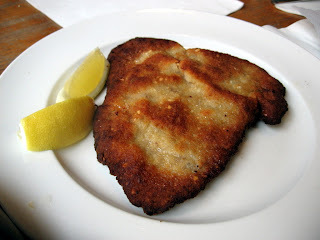 Breaded veal cutlet, pounded thin, and served with only a lemon for garnish. Fairly standard, although composed completely of carbs. Also, Alexis haes orange juice and bananas, so this wasn't particularly appealing to her. Standard airplane food. 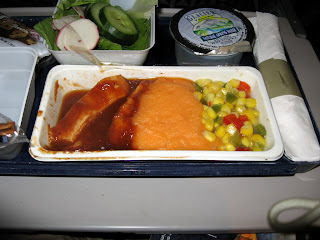 The chicken was bathed in a very sweet sauce, but it was not overcooked. We knew we wouldn't be getting anything good on the plane, so we brought our own snacks. 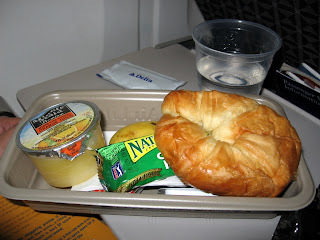 Since airlines no longer serve food on domestic flights, we thought it wise to try to get a bite before getting on the plane. 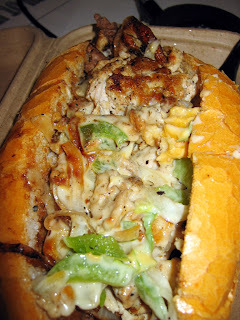 Unfortunately, all you get at the airport is very expensive sub-par food. We ordered a croissant sandwich, but this crappy thing arrived instead. We ate the eggs, but this was expensive and bad. We'll be in Berlin and Prague until July 8th. Check back shortly thereafter for lots of great pictures and reviews from half way around the world. Happy eating until then! 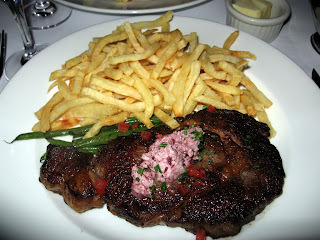 We decided to have a quick dinner at our favorite French bistro, Fringale. 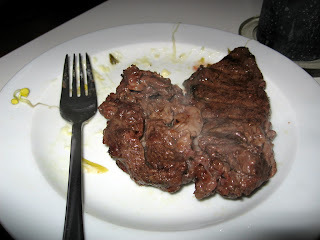 We both opted for the steak tonight, which has always proved delicious and did not disappoint tonight either. Tender, tasty, juicy, falvorful meat. 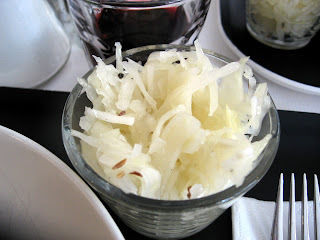 The red wine butter has just the right amount of acidity and is beautiful as well. The fried were crispy, and we ate more of them than we should have. For dipping the fried in. This was not very spicy and a bit too watery. One of the things we love about Fringale is dipping our fries in this lemony, smooth, house-made mayo. 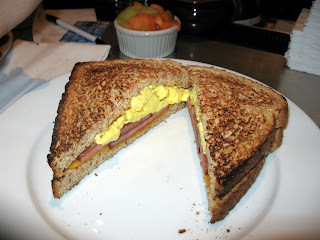 Even with Giao's trick of mushing the meat from 2 sandwiches into one, this one just didn't cut it. Not enough meat. 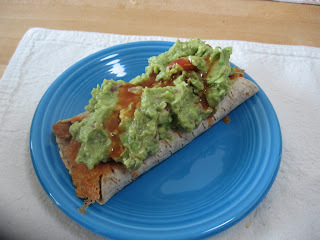 This gets better with age, as the flavors meld, so it's a great option for a lunch at work. Still tasty, if a bit thicker the second time around. 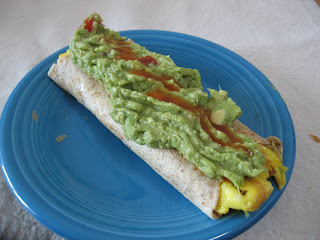 Bacon, Egg and Cheese Low Carb Breakfast Burrito. 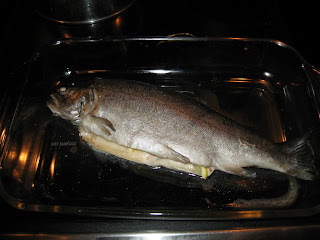 This trout was stuffed with a few lemon slices and seasoned with salt and pepper, then baked on 375 for about 10 to 15 minutes. 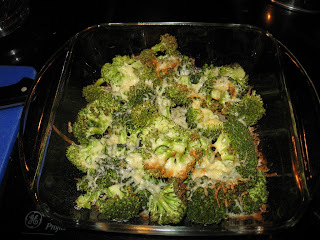 Roast the brocolli, covered on 375 for about 25 minutes. 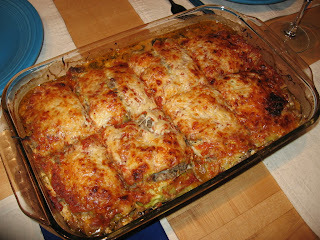 Then remove the covering, sprinkle with parmasean, then bake for another few minutes, until the cheese beings to brown. 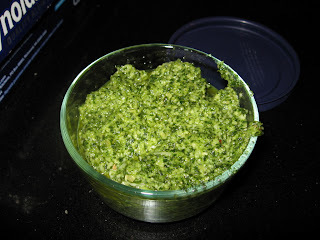 Pesto is a great flavor booster and this was delicious when slathered all over the freshly baked trout. 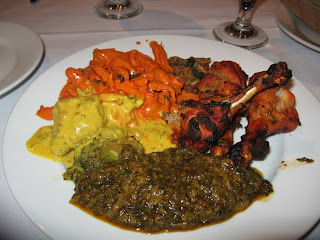 Tandoori Mahal is probably our favorite Indian buffet in the financial district. You really can't beat the $7.95 per person price. And the freshly baked naan brought to your table is a highlight as well. Pakora Curry (oddly sour, but tasty), Chicken Mahkni (bright orange, but yummy), Tandoori Chicken (flavorful and tender), Chicken Saag (a bit overcooked). Repetition seems to be our strong suit for breakfast. It makes it easier in the morning to not have to think about what you are going to eat. 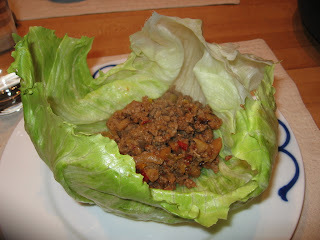 Lettuce cups are a great way to use up leftover bits of ingredients in the fridge. 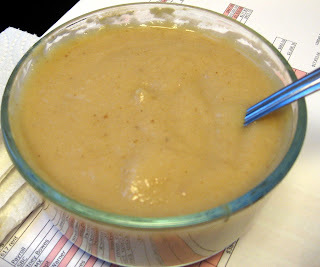 This is also a great low-carb meal and it contains very little fat. Sautee the onion, zuchinni and chili peppers in the soy and chili garlic sauce. 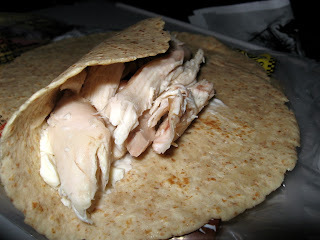 When soft, add the rest of the ingredients except for the lettuce and cook until meat is browned and cooked through. 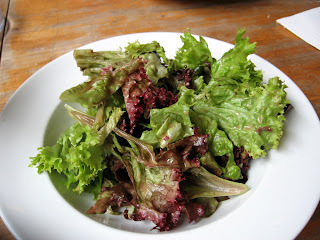 Spoon into separated lettuce leaves, fold into packets and eat. 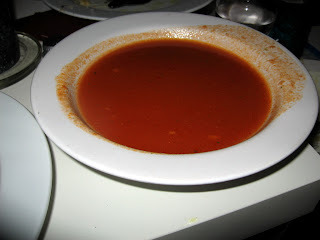 Creamy, tangy, spicy and very good. Fresh ingredients, but dry chicken. 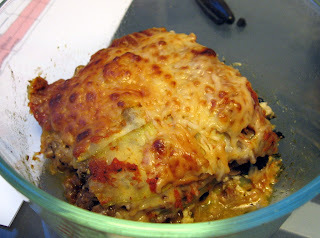 Giao had leftover zuchinni lasagna. A nice variation on our standard breakfast. 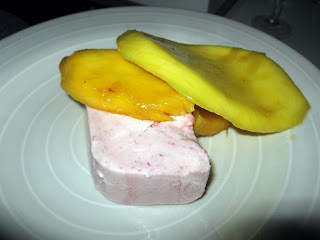 This dessert was inspired by and created for a food blogging event called "They Go Really Well Together" hoste by Bounteous Bites. Apparently strawberries and coriander contain similar 'impact oderants". In any case, the dessert came out really well. I was really concerned that the coriander would overpower the strawberries, so I decided to use coriander seed instead of fresh coriander, and to infuse the cream with the coriander rather than keep the coriander in the dish. 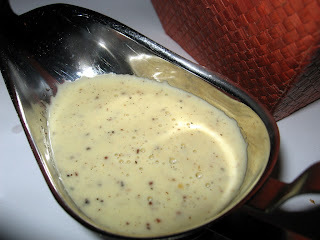 This method proved effective in that the custard was subtle in coriander flavor, yet also unmistakable. True to the name of this event, coriander and strawberries really do go really well together. In a heavy sauce pot whisk 1/4 cup of the cream, salt, 1/4 cup of the sugar and the cornstarch together until smooth. Add the remaining cream and coriander seeds and heat until bubbles are beginning to form around the edges of the pot. In a bowl, combine the rest of the sugar and the egg yolks. Temper the yolk mixture with the hot cream, then combine the rest of the cream and egg yolk mixtures. Heat until the mixture reaches 170 F, stirring constantly. 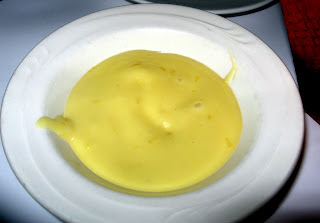 Strain the custard through a fine sieve and pour the custard into into a bowl set in a bowl of ice water, and stir frequently until cool. Then refrigerate overnight. 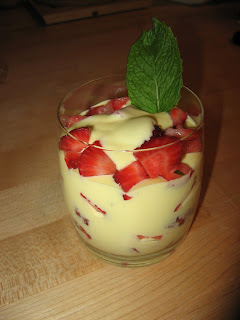 When ready to serve, layer diced strawberries with custard piped out of a ziplock bag with the tip cut off. Garnish with mint and serve. Hearty, thick and flavorful, although probably better suited for winter than summer. Roast the cauliflower on 400 until tender and lightly browned, about 30 minutes. Sautee the onions and garlic in a bit of olive oil until beginning to brown. Add the turnip and the broth and bring to a boil. Simmer until the turnip is tender. 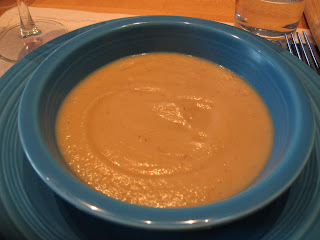 Add the roasted cauliflower and puree until smooth with an immersion blender. 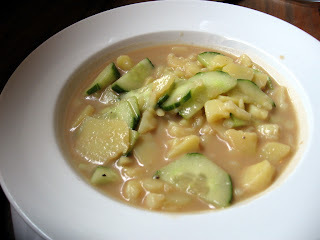 Click above for the recipe and a video demonstration of how to make noodles out of zuchinni. This dessert was inspired by and created for a food blogging event called "They Go Really Well Together". Apparently strawberries and coriander contain similar 'impact oderants". In any case, the dessert came out really well. 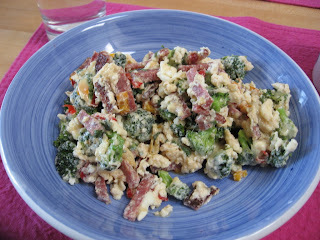 The eggs served as a background holding together all of these yummy ingredients.